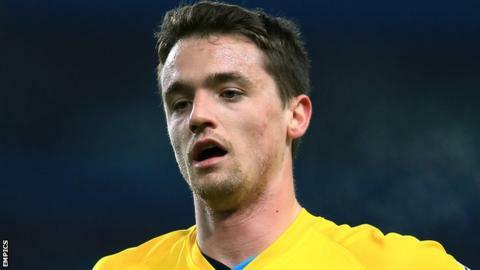 Wycombe moved up to fourth in the League Two table with victory against Exeter City thanks to Stephen McGinn's first goal for the club. Exeter could have taken the lead after five minutes but Jayden Stockley nodded Jamie McAllister's cross just wide. Joel Grant nearly put the visitors in front against his former club but Ryan Allsop saved and Stockley fired wide. Wycombe took all three points when McGinn curled a fine effort into the top corner from 25 yards out. "It is a home win and a home goal, which is more important. "We deserved it. Those people here today will have seen us grow as a club and as a team, the way we played and the way we set up today against one of the best footballing teams in the division. "Some of the work rate today was phenomenal. And to mix that with some of the good football we played we've got a nice end to the first win of 2016 at home. "For a team that was written off at the start of last season, then not meant to recreate what we did last season, we're doing okay." Match ends, Wycombe Wanderers 1, Exeter City 0. Second Half ends, Wycombe Wanderers 1, Exeter City 0. Attempt saved. Luke O'Nien (Wycombe Wanderers) left footed shot from the centre of the box is saved in the bottom left corner. Corner, Wycombe Wanderers. Conceded by Jamie McAllister. Attempt missed. Troy Brown (Exeter City) header from the centre of the box is too high. Corner, Exeter City. Conceded by Matt Bloomfield. Substitution, Wycombe Wanderers. Matt Bloomfield replaces Stephen McGinn. Substitution, Exeter City. Jake Taylor replaces David Wheeler. Attempt missed. Sam Wood (Wycombe Wanderers) left footed shot from outside the box is close, but misses to the left. Michael Harriman (Wycombe Wanderers) wins a free kick in the defensive half. Substitution, Exeter City. Ryan Harley replaces Joel Grant. Attempt missed. Alex Nicholls (Exeter City) right footed shot from outside the box is just a bit too high. Corner, Exeter City. Conceded by Sam Wood. Corner, Wycombe Wanderers. Conceded by Joel Grant. Substitution, Exeter City. Lee Holmes replaces Ollie Watkins. Corner, Wycombe Wanderers. Conceded by Ollie Watkins. Michael Harriman (Wycombe Wanderers) wins a free kick on the left wing. Jamie McAllister (Exeter City) wins a free kick in the defensive half. Attempt missed. Marcus Bean (Wycombe Wanderers) right footed shot from outside the box misses to the right. Luke O'Nien (Wycombe Wanderers) wins a free kick in the defensive half. Foul by Stephen McGinn (Wycombe Wanderers).